Octoberfest’s decidedly malty flavor comes from a generous portion of Vienna Malts. The maltiness is balanced by German and Czech Republic noble hops for dryness. The balance between the malt and the hops and the long, cold (30 degrees F) maturation process make this an exceptionally drinkable beer. This was another gift from my friend Gene. I have had a few Dominion beers but I have not had this one. The beer pours a clear dark copper with amber hues and a fairly rich off white head. I can smell the rich caramel malts while pouring. The nose is delightful with rich toasted caramel malt and floral hop aromas. Not bad, Not bad at all. The taste starts out with a caramel malt sweetness up front on the tip of the tongue followed by a very pleasant effervescence over the tongue in mid-sip. The back end is very easy drinking and very refreshing. The finish is wonderful with toasted malts and a nice light hop finish. There is a very unique malt robustness in the finish and that also carries through to the final aftertaste. The robustness is not a malt bitterness but more like a German Alt (old) beer flavor. This is a very nice surprise for an American Oktoberfest. All and all I’m very pleased with this beer. Let’s see what happens as it warms. We are now at 58 degrees. This beer is getting smoother and the malt flavors are definitely getting better. The malts are richer now, still with that nice German malt flavor/aftertaste. This is so nice it’s not straying around very long; I’m almost to the bottom of the glass. And the only bad thing is I only have one of these. The malt robustness gets more defined as it warms but never develops any off flavors. This is a B for sure. 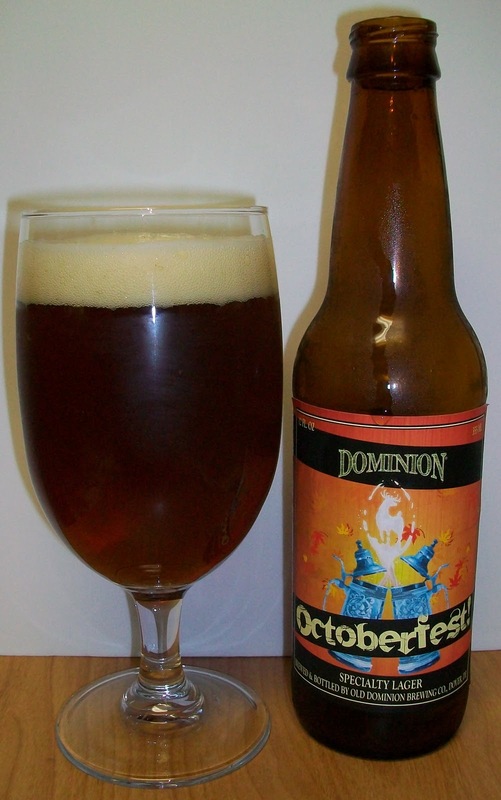 It’s a very nice Oktoberfest with a surprising German malt flare.